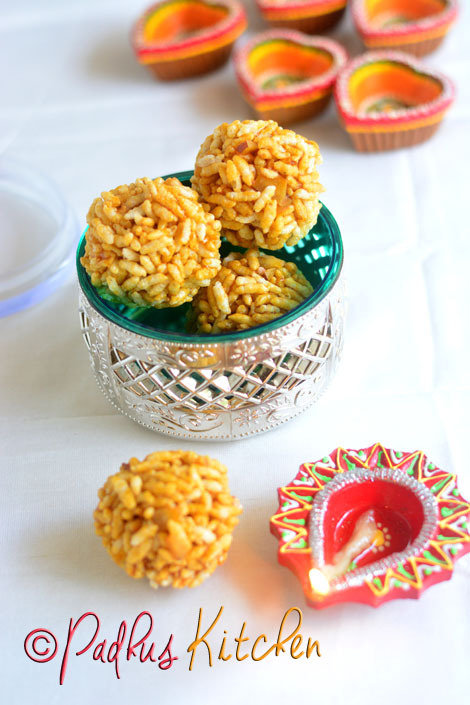 I have already posted pori urundai/puffed rice balls with the regular puffed rice. This time I wanted to share the traditional aval pori urundai (usually prepared for karthigai deepam) and nel pori urudai recipe. Today we will learn how to make Aval Pori Urundai (Thirukarthigai Deepam Special) following this easy recipe with step wise pictures. Melt jaggery in 1/4 cup of water and filter it to remove any impurities. Boil the jaggery water, add coconut bits, cardamom powder, dry ginger powder and ghee. Boil on medium flame until you get a soft ball consistency. When you drop a tsp of jaggery syrup into a cup of water, it should not dissolve but you should be able to collect it and make a soft ball out of it. That is the right stage to remove the jaggery syrup from heat. It is called soft ball consistency. Once the jaggery syrup reaches the soft ball stage, add the aval pori to the jaggery syrup and mix well so that all the pori is well coated with the jaggery syrup. Alternatively you can also add needed jaggery syrup to the aval pori kept on the greased plate. Mix it nicely with a ladle. Follow any method which is comfortable for you. Note - You can make balls only when it is warm, otherwise the pori will stick to your hands and you will not be able to shape it. Dust rice flour generously as it will be easier to make balls and also prevent your skin from getting scalded. 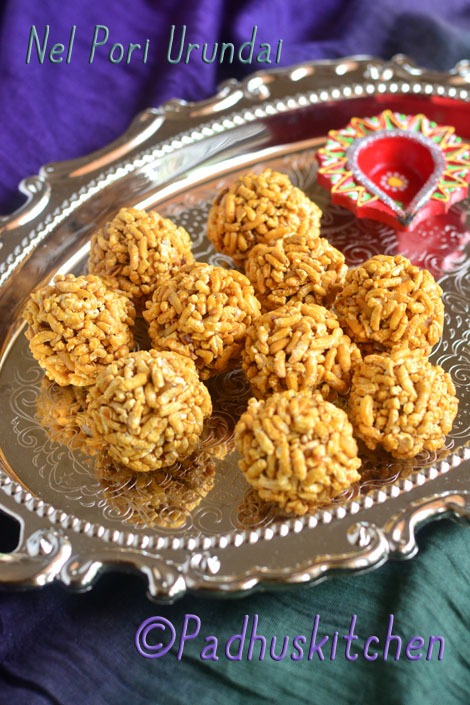 Use jaggery (paagu vellam) specially for making these type of sweets. It stays fresh and crisp for 3-4 days if stored in an airtight container. I made pori urundai with nel pori also. The picture below shows Nel Pori Urundai. If you are using nel pori, you have to clean the paddy husk from the pori which is very time consuming, yet I did one batch with nel pori to show you all. Follow the same recipe above for this also. Note-(Nel pori is different from aval pori). I love this and they looks so good.. Thanks for the recipe. Am trying it today as per your instructions. My granny adds pottu kadalai and groundnuts also. am trying this today as per the recipe given. Thanks a ton! Thanks a ton! I am trying this out today. Pori urundais turned out perfect. Rice flour trick was just awesome.Thank you so much for the detailed instructions.